Winter is nearly upon us, and the temperatures are falling. That means it's time to start shopping for warm clothes for the whole family. Kids can be tough to buy for. You want clothes that are warm, durable and affordable. They want clothes that are trendy. 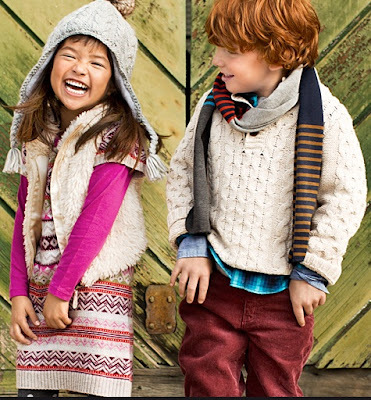 Why not shop for winter clothes that will appeal to both the parents and the kids? Here are some ideas to get you started. Layers are a great way to keep kids warm while they're outside waiting for the bus, but comfortable inside stuffy classrooms. Cardigan sweaters are must-have pieces for trendy winter wardrobe. 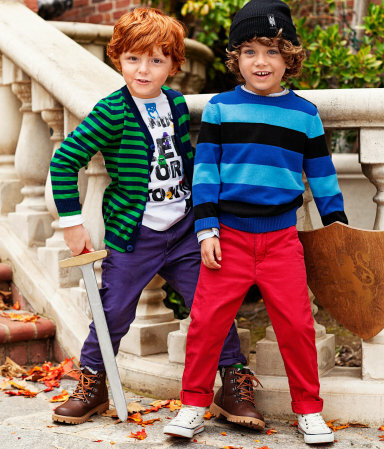 Kids can choose fun colors and knits that fit their own unique personalities. Jackets and big button-down shirts are also good choices. Layered with a t-shirt, both boys and girls will be cozy and warm, while looking cool. Choosing a trendy coat is a smart choice for allowing kids to display their personalities. All kids need a warm coat for the winter. It's likely, however, that this staple wardrobe piece will only fit your child for one season. So why not let them have a little fun with it? Military style coats and puffy parkas are some popular choices to consider. Hats, gloves and scarves also offer opportunities for kids to express their individuality, while satisfying parents' desire for practicality. The possibilities are practically endless. Let your kids pick accessories in colors to match their outerwear or even go a little wild with bright colors and prints. The infinite style scarf is popular now and is a good choice for its practicality, as it's not as easy to lose and isn't as cumbersome as a traditional scarf. Gloves come in all styles as well, with mittens and fingerless gloves available to mix things up a bit. Jeans are probably the most popular choice in pants for the winter months. Colored denim is big this year for both kids and adults. Kids will love picking out their favorite hues, and you'll love the fact that these rugged pants will last through the winter. Another popular denim style is dark jeans. Dark washed denim is versatile and can be worn with dress shirts for a band concert or with t-shirts for everyday. Boots are an extremely popular fashion trend with kids. Tall, skinny boots for girls are in fashion, while boys will love a pair of rugged work-style boots. Choose leather or rubber, as they stand up to the elements better than suede. Wellies are good for both boys and girls and come in every color imaginable, even prints. One closing piece of advice would be to bring your child with you on your shopping trip. Let's face it, kids are picky. While the parents ultimately have the last say, you can avoid arguments, the hassle of returning items or the wasted dollars of clothes hanging in closets unworn by involving kids in the shopping process. About this guest blog post: Brianna Kelly has over 5 years experience publishing articles on childcare education and parenting. She writes on a regular basis for www.giraffe.ie , a Dublin based childcare provider. Lots of great tips! Madison loves her jeans. Although she would wear a dress every day if she could. Jeans are so much more practical for school.